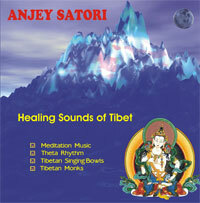 This deep meditation and relaxation music CD featuring sounds of Tibetan singing bowls and bells, guttural singing and theta-rhythms is ideal for deep meditation and relaxation, wah savasana and other yoga practices. It is known that ambient relaxation music and and theta-rhythms has positive influence and can help for headache and insomnia cure. You can free download 2 tracks - Moon Night and River Meditation.